Home > Economics help blog > economics > What Debt Levels are Dangerous? What Debt Levels are Dangerous? Readers Question: Could you please help me understand why high debt as a big percentage of GDP is bad, or at what point does it becomes bad? Japan is at something like 194%, and the UK at 500% (counting all debts and liabilities). Both countries are still waking up every day and going about business (I guess). What do those comparisons of debt to GDP actually tell me? Firstly, the statistic for UK at 500% looks like UK external debt. Or more likely it could refer to the total UK debt i.e. Private + Public debt. See: UK Total Debt. 194% looks like Japan’s government debt, though Japan government debt is now over 220% of GDP. Total Japanese debt is similar to the UK. The government often need to know and decide at which level public sector debt is a problem. Also, if you look at historical national debt, the UK has had much higher debt levels. In the early 1950s, UK debt was over 200% of GDP. Does that mean the UK could triple its current government debt? Well probably not. Circumstances are different in 2012 to the early 1950s. From these statistics, you might expect Japan to be in the greatest difficulty because it has by far the highest levels of debt. Yet, markets are not really concerned about Japan public sector debt levels. Bond yields on Japanese government debt are very low. See: Why can Japan borrow so much? Note: If markets fear a government is borrowing too much (if they fear government may become insolvent or illiquid) then they will sell these government bonds. Selling bond yields pushes up the interest rate. Higher bond yields are a sign that the debt is considered risky. In other words, markets need a higher interest rate to compensate for the increased risk. So What Debt Levels Are Dangerous? Above 60% of GDP. Government debt above 60% of GDP would be considered to be problematic. 60% is somewhat arbitrary, but it was chosen for the Maastricht criteria. Above 100% of GDP. This is another warning statistic. Once debt increases above 100% of GDP, it becomes a bigger cause for concern. Generally higher debt levels are potentially more problematic. As debt to GDP rises, markets are more likely to be concerned and be less willing to buy debt. Therefore, as debt to GDP rises, interest rate rises. Therefore, the governments interest bill can increase. Rate of Economic growth. If your debt increases by 5% a year, but you have economic growth of 5% a year. Then you are stabilising your debt to GDP ratio. If your debt increases by 5% a year, but you have negative economic growth of -2%, then your debt to GDP ratio is increasing by 7% a year. Clearly, economic growth is a key factor in determining debt to GDP. GDP growth is just as important to actual debt levels. Rate of Increase. At the start of the Euro crisis, countries like Spain and Portugal had low debt levels. However, a budget deficit of 10% of GDP, means total government debt will be increasing very rapidly. UK debt at 64% of GDP is quite respectable by historical standards, but, annual borrowing is around 10-12% of GDP, so markets are more concerned about the rate of increase. Liquidity. Countries in the Euro have proved much more susceptible to rising interest rates. The UK has benefited from having a Central Bank willing to create money and buy bonds. This keeps interest rates low and gives markets confidence there will be no liquidity crisis. But, Euro countries don’t have this. If investors don’t buy enough bonds, there is no guarantee a Central Bank will deal with temporary liquidity crisis. 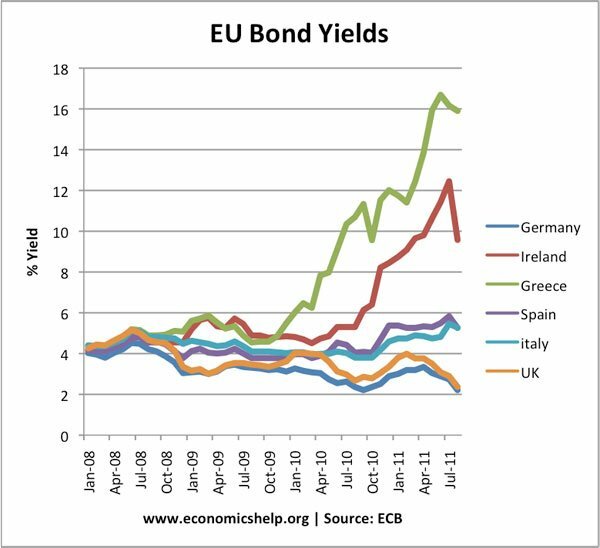 This is one reason why Euro countries have been susceptible at even relatively low debt to GDP ratios. If private debt is low, and private savings high, it is much easier for the government to borrow. If the private sector have high levels of savings, they will be willing to use their savings to buy government bonds at low interest rates. However, if private sector savings are very low, who is going to buy government debt? Often in a recession, private sector saving rises, government borrowing is a way of soaking up this rise in private saving and injecting money into the economy. Therefore, a rise in government debt during a recession is less of a concern than during high growth. External debt could be an issue. The UK has high external debt (though also high external assets). But, if there is a rapid fall in the value of its external assets it could be vulnerable. About 30% of UK debt is financed by foreign banks. If you rely on foreign funding of government debt, you might be more susceptible if foreign countries fear a devaluation in your currency. Should We Worry about UK Total debt of close to 500% of GDP? Yes, it is very high. It tends to indicate lower growth as the government and private sector try to reduce debt levels. It also depends on the type of debt. Debt secured by the value of a house is less risky than say borrowing on credit card. ← Should the Unemployed Work for Benefits?